The technique relies on the use of tissue spheroids, densely packed aggregates of living cells that can be used as building blocks for bioprinting functional human tissues and organs. Tissue spheroids offer the highest possible theoretical cell density, comparable with natural tissue, while their compact round shape makes them easy to handle and process. Tissue spheroids also have a complex internal structure and multicellular composition, and can even be pre-vascularized. When placed closely together so ther are directly touching, they can fuse to produce complex 3D tissue constructs – which is how tissue fusion occurs during natural embryonic development. Several techniques are available to fabricate tissue and organs using tissue spheroids, but all rely on 3D scaffolds, nozzles and biolabels. 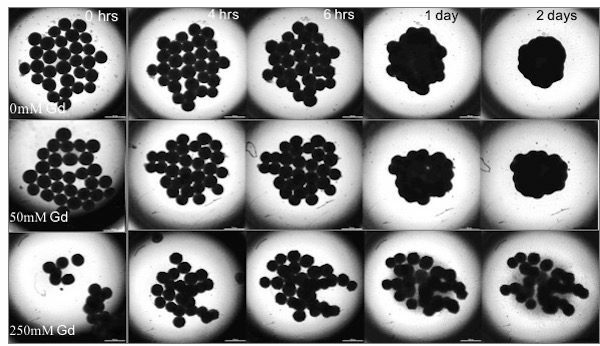 One method, for example, requires cell aggregates to be placed into 3D scaffolds made from various biodegradable materials, while another involves attaching and spreading tissue spheroids on electrospun matrices. And, although researchers routinely use magnetic forces to create 2D patterns of tissue spheroids biofabricated from cells, these cells first need to labelled with magnetic nanoparticles. The new technique, developed a by team of researchers led by Vladimir Mironov of the Laboratory for Biotechnological Research “3D Bioprinting Solutions” in Moscow and Utkan Demirci of Stanford University, instead exploits magnetic levitation to assemble the tissue spheroids into a 3D structure. It therefore avoids the need for any scaffolds or labelling, and it also works without traditional nozzle-based bioprinters.